In order to make informed decisions, there are three important elements: intuition, trust, and analytics. Intuition is based on experiential learning and recent research has shown that those who rely on their “gut feelings” may do better than those who don’t. Analytics, however, are important in a data-driven environment to also inform decision making. The third element, trust, is critical for knowledge sharing to take place. These three elements―intuition, analytics, and trust―make a perfect combination for decision making. This book gathers leading researchers who explore the role of these three elements in the process of decision-making. 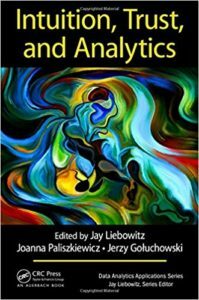 In Chapter 14, Judith Hurwitz discusses “Looking Toward the Future with Cognitive Computing, AI, and Big Data Analytics”.